When plants that evolved in one region of the globe are moved by people to another region, a few of them flourish, crowding out native vegetation and the wildlife that feeds on it. Besides damaging wildlife habitat, these invasive plants can degrade our food and water supply and increase the risk of damage from wildfire and flooding, all of which can cause major economic damage to our state. Peruse a photo gallery of the plants on the Cal-IPC Inventory. Plants are listed in alphabetical order by scientific name. Listings link to full Plant Profile pages with more information on each plant. 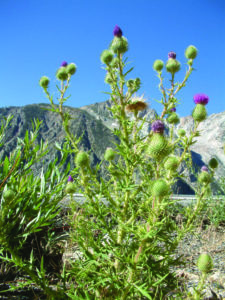 Are you interested in knowing which horticultural plants may cause problems in California’s natural areas? This page lists only those plants from the Cal-IPC Inventory that are known to be used in horticulture. The list can be filtered for your region. The Cal-IPC Inventory lists plants that threaten the state’s natural areas, based on transparent science-based criteria and expert reviews. The inventory includes plants that are currently causing damage, as well as “Watch” plants that are a high risk for becoming invasive in the future. It is updated regularly to reflect the best available information. Why are invasive plants a problem? Their presence impacts everyone in California. Left unchecked, these plants damage wildlife habitat, agricultural production, and water resources. Controlling invasive plants is one of the top priority actions recommended for climate adaptation.